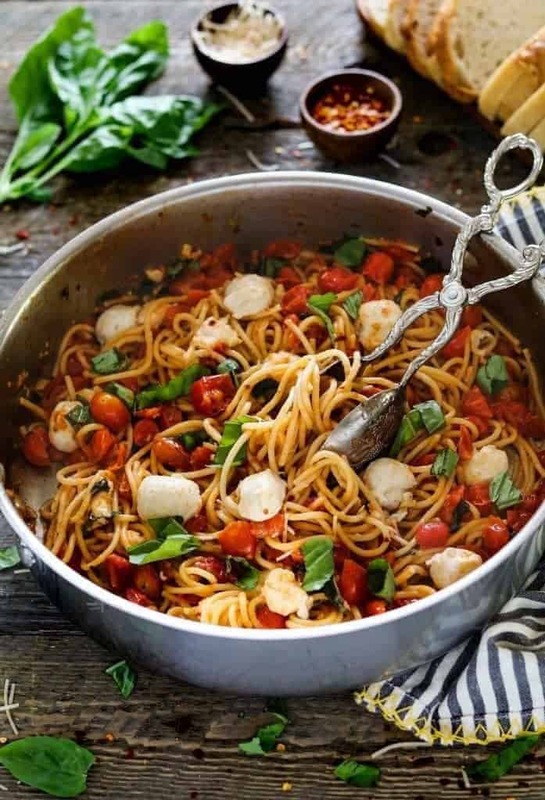 11 of the best vegan pasta recipes all in one place! From Creamy Alfredo Pasta to Pasta Caprese, there is a recipe for everyone. Most recipes made in 30 minutes for quick and delicious weeknight meals. Who wants a big plate of pasta? Spring, summer, winter, and fall I will dig into all the pasta you give me. One of the reasons I love a good pasta dinner is because there are so many variations of vegan pasta dishes. From creamy sauces to hearty bolognese to tart and fresh tomato pasta, there is a recipe to fit your cravings any time of year. Here are 11 of my favorite vegan pasta recipes. 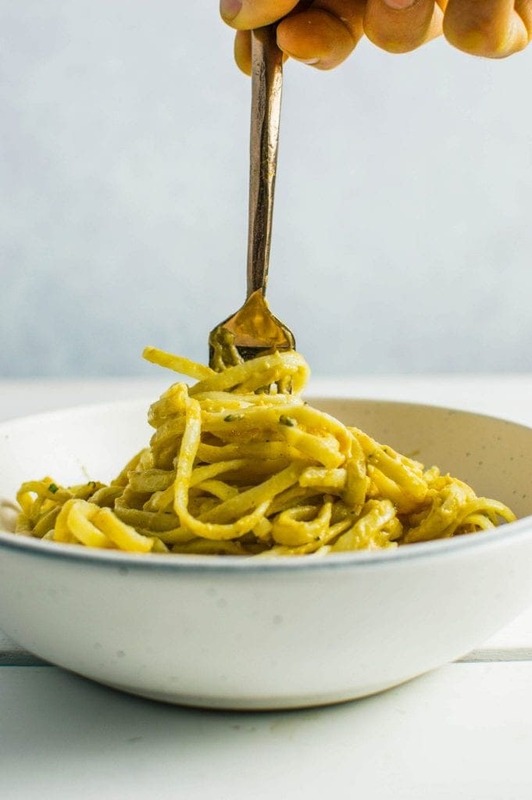 A few of these vegan pasta recipes are gluten-free, most of these recipes can be made in 30 minutes or less, and all of these recipes are delicious, hearty, and perfect for your weekend dinners. In most cases, when making pasta you want to cook the pasta until it is al dente. That is slightly before soft. This gives the pasta texture and allows it to continue to soften when mixed with different oils and sauces. When your pasta is done cooking, strain it through a colander and toss the pasta with a bit of olive oil. This prevents the noodles from clumping together as you prepare the rest of the meal. Serve pasta dishes with crusty bread and a big Caesar Salad. Leftover pasta can be stored in an airtight container in the refrigerator for up to 3 days. To reheat, gently reheat the pasta over the stove with 1-2 tablespoons of water. I love this Vegan Pesto Pasta with Summer Veggies from My Darling Vegan. 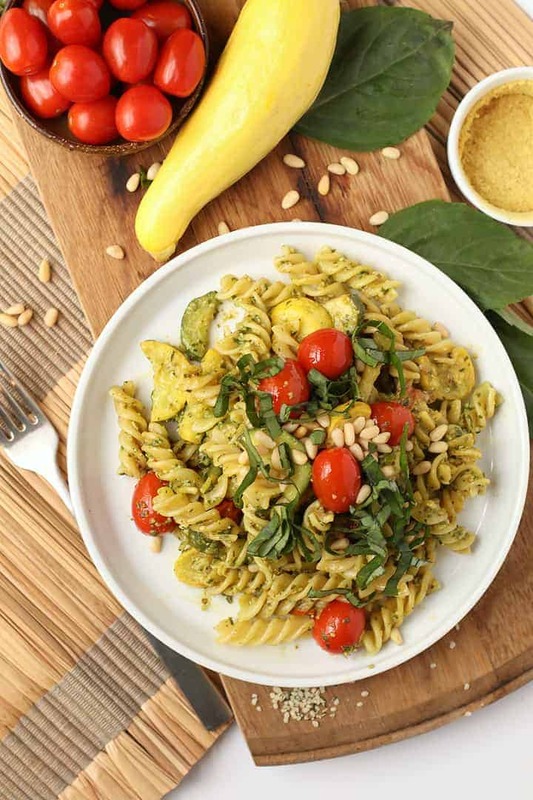 Made with an easy 5-minute pesto sauce and tossed with sautéed summer squash, zucchini, and cherry tomatoes, this light and refreshing dinner is simply divine. Take a look at this decadent Pasta with Garlic Cream Sauce from From My Bowl. 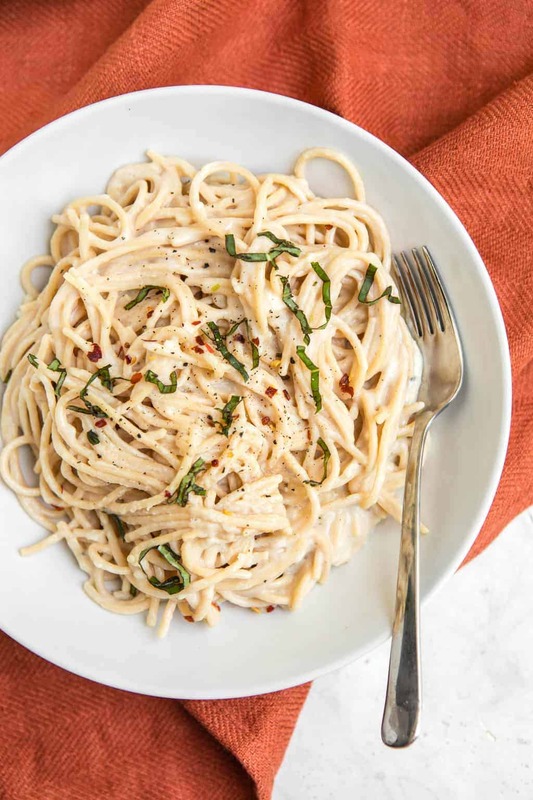 Made with just 6 ingredients (plus spices) you won’t believe this creamy and delicious pasta dish is dairy and gluten-free. It can all be yours in just 20 minutes! It’s Vegan Pasta Caprese from Vegan Huggs! Made with cherry tomatoes, fresh basil, and homemade vegan mozzarella, this 30-minute meal has the taste of summer in every bite! I love this Cauliflower Scampini with Garlic White Wine Sauce from Veggies Inspired. 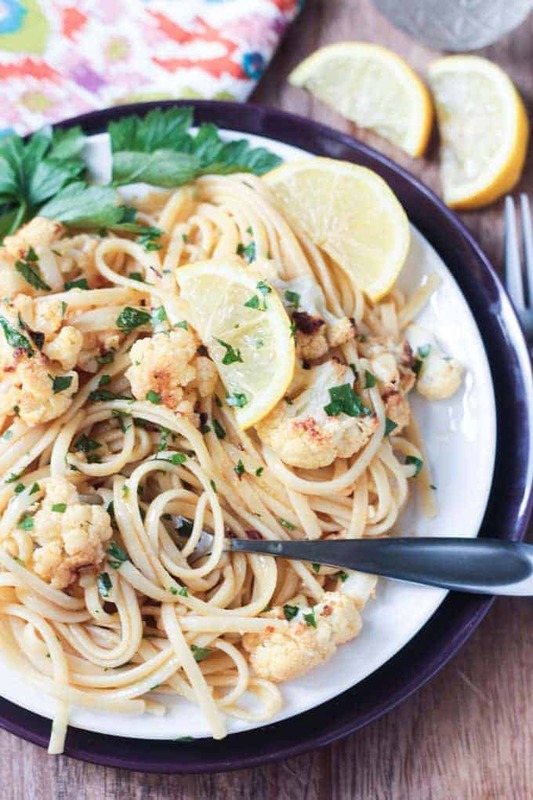 Bursting with fresh flavors of lemon, garlic, and parsley and filled with deliciously seasoned cauliflower florets, this pasta dish is one to love year around! When it comes time for fall inspired pasta-dishes, make sure to check out this Butternut Squash Pasta from My Darling Vegan. 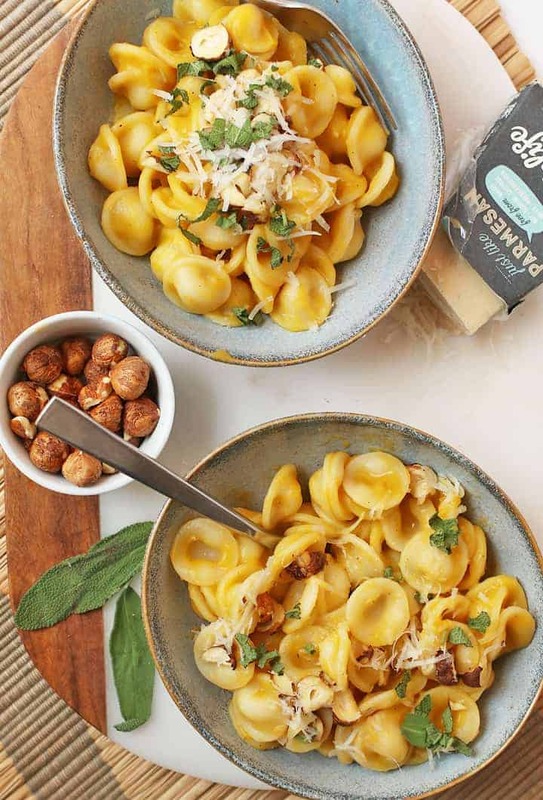 It’s butternut squash pasta mixed with roasted hazelnut and sautéed garlic and sage for a meal so creamy that no one will believe it’s vegan. 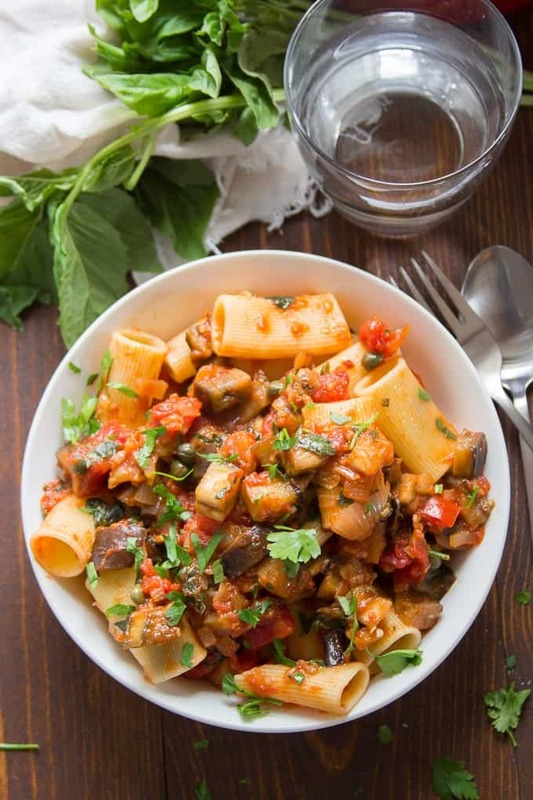 I can’t get enough of this Spicy Eggplant Pasta from Connoisseurus Veg. It’s a pasta packed with delicious spice, fresh herbs, and smoky tender eggplant. Hearty, wholesome, and delectable! Baked Ziti is the ultimate comfort meal and I think you’re going to love this variation from My Quiet Kitchen. 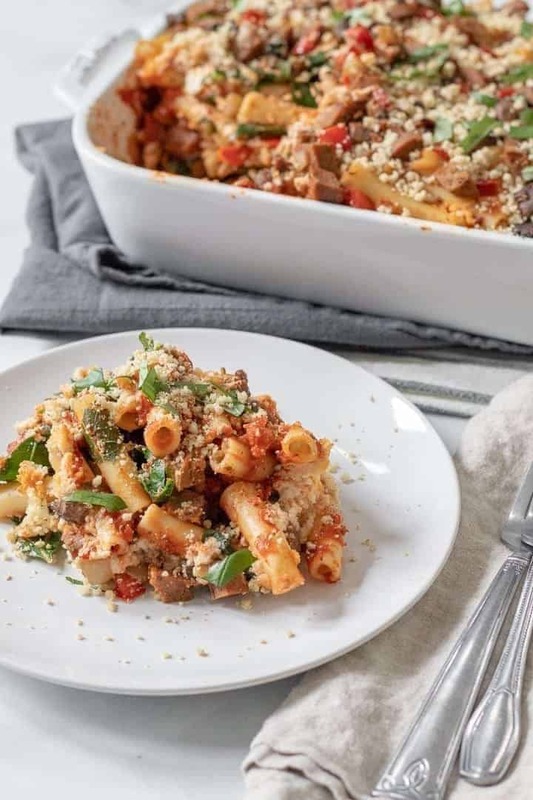 Loaded with fresh veggies, homemade almond ricotta, and vegan sausage, this hearty meal is one that the whole family will love. 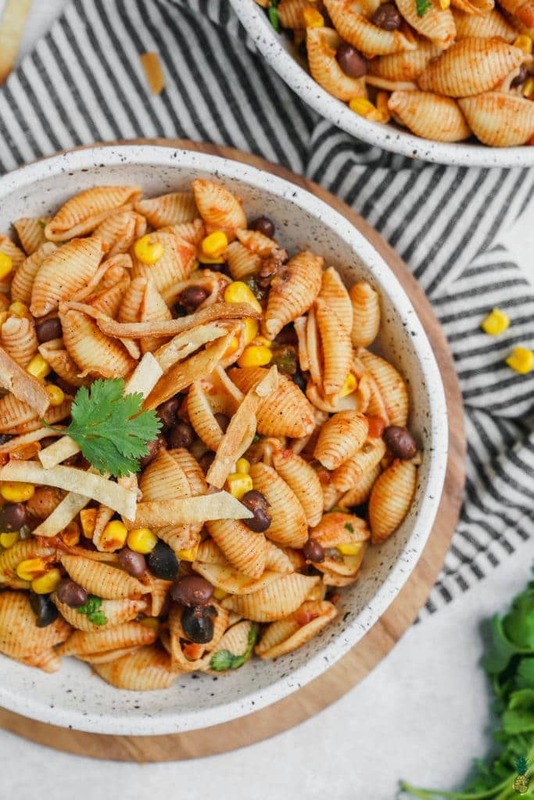 Check out this One Pot Taco Pasta from Sweet Simple Vegan. It can be made with just 7 ingredients and for under $5. The result? A hearty and wholesome pasta meal that is ready in 15 minutes for the perfect weeknight meal! 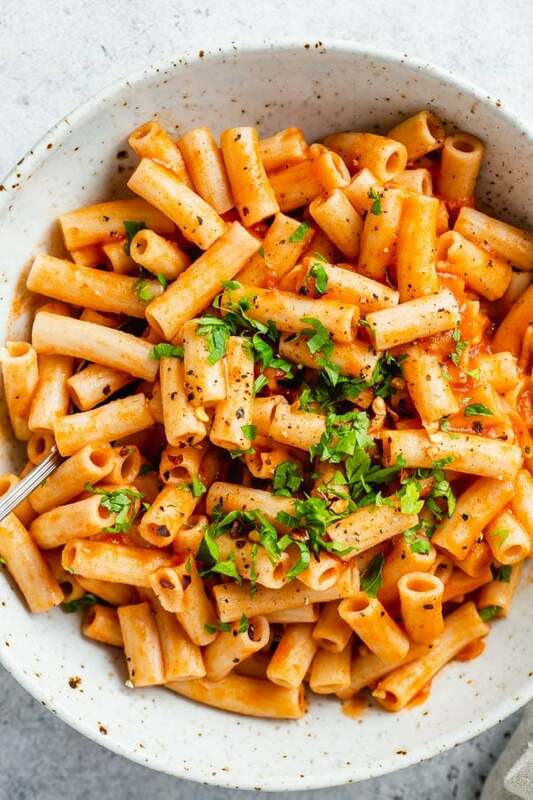 I’ve been loving this Roasted Red Pepper Pasta from Choosing Chia. Made with just a handful of ingredients, including deliciously charred roasted red peppers, this creamy and rich vegan pasta is definitely one you’ll want in the weekly rotation. I love vegan Alfredo sauce and this version from My Darling Vegan is one of my favorites! This creamy base is made from mashed cauliflower mixed with nutritional yeast, lemon, garlic, and onion for a healthy spin on a classic pasta dish. Or take a seasonal spin on classic Alfredo with this Pumpkin Alfredo from Plant Based Scotty. This creamy pasta sauce is made with pumpkin and coconut milk that is seasoned with pumpkin spice and sage for a delicious fall pasta meal. There you have it. 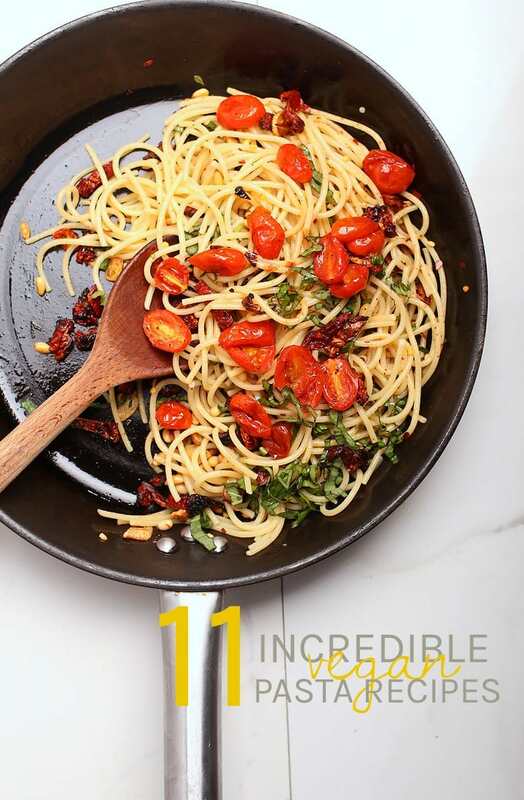 11 of my favorite vegan pasta recipes. What are your favorite pasta dishes?